SO WHAT EXACTLY IS DOG OWNER ETIQUETTE? AND WHAT ARE THE SURVIVAL TIPS? Cleanliness in next to dog-li-ness, my mother always used to say. I may have misheard her, but I think you get the picture. If you have a dog (or any per, for that matter) always clean up behind it before you leave the area. Always! It is very poor etiquette for an owner to leave smelly landmines in the path of those who are about to walk this way. Whether your dog is big or small, the rule doesn’t change. Clean up. Clean up! There, I’ve said it again. You’ll find other people far more tolerant and will smile when they see you out in the fresh air with your dog. You may even make them envious and perhaps eager to become a pet owner too with the positive reinforcement of correct and considerate behaviour. I have listened to clients complain about being ambushed by other dogs when they take their dog for a walk in their own neighbourhood. Far too many people who own dogs don’t fence their properties properly. This is irresponsible. It is not right for an unrestrained dog to charge out on to the street when another dog owner is walking past with their dog on a leash. It can be very dangerous for all involved, and clearly it doesn’t help if only one owner has done the responsible thing. In a best case scenario and ‘ambush’ will ruin the walk for both the dog and the owner involved. In a worst case scenario, there could be a dog fight – or one of the dog’s risks being run over. This is a preventable situation, though, whether by training or pure management. Many more dog owners would be encouraged to take their dogs for frequent walks if it was safe for everyone. All it takes is a little more responsibility. Every time a dog escapes from its yard, you have a potential disaster waiting to happen. If taking your dog for a walk around the neighbourhood is not a possibility, then find out where the nearest park of safe area is – somewhere that dogs are allowed on leash. Put your dog in the car and drive to your chosen walk spot. It could be the park, the racecourse, or one of the beaches where dogs are allowed. Dogs need exercise and stimulation outside of their property, and so do you as a human! When you take your dog out in public, always keep the dog on a leash. This is a By-law in many areas. No matter how trained or socialized you believe your dog is, be considerate. Always think about other people’s reactions. Some people are terrified of dogs. Also, the reaction of other people’s dogs could be very dangerous indeed. This brings us to dog walking etiquette – not every dog is trained or socialized. It is rude and dangerous to allow your dog to run up to other people or their dogs while walking. Dogs also have personal space boundaries as do humans. Even trained and socialized dogs have space boundaries as do humans. Even trained and socialized dogs have space boundaries. 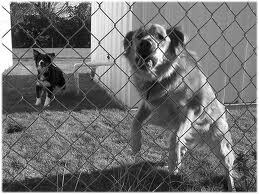 Allowing your dog to come into another persons or dog’s space without asking permission is rude and dangerous. Some dogs need more space than other dogs, and this is absolutely fine. It is polite and proactive to ask for permission first. Ask the other person: “Is it okay if my dog can greet your dog?” It is also equally polite and proactive for you to say to another person “No, sorry, my dog is in need of space”. A responsible dog owner will not take offence to this. They will be thankful that your proactive polite response has prevented a conflict situation. And please do this BEFORE you’re already into each others space! Learning about Calming Signals and dogs body language from a good training school or Companion Animal Behaviourist will take you a long way towards understanding your dog's reaction to situations. If you understand the signals and are better able to read the dog, you will avoid most dangerous situation. Be mindful of the time of day you are walking your dog and the type of surface that they are walking on. Midday temperatures in summer can soar. A hot pavement can burn your dog's paw pads. Be super aware of children and dog's interactions. Children MUST be supervised around dogs at ALL times. It takes just a moment for a situation to turn dangerous for both the child and the dog - and perhaps even a court case! Never forget to have water available for your dog while on an outing. Using confrontation training methods with our dog can create mistrust, confusion and fear in your dog. 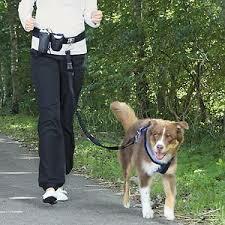 This in turn can make walking a very unpleasant experience for both you and your dog. It can create aggressive behaviour in your dog. Using force - or aversive methods - are not necessary to get through a walk with your dog. Rather seek out a qualified Positive Reinforcement dog trainer / Companion Animal Behaviourist to guide you through some of the training so that you can get the best out of your walks. Take a small bag of treats with you when you walk. Having treats that your dog really enjoys along on the walk will also help make it a positive experience for him. Have good timing treating him whenever his is doing well or is relaxed and content. Finding the right kind of equipment that will be comfortable for your dog and manageable for you is a must. A comfortable flat collar and lead or a well fitted harness would be my choice. Choke collars /choke chains, prong collar and shock collars are aversive equipment. They make walking a scary, intimidating, and painful experience for your dog. There are a lot of great options on the market, and with a little advice from a professional, find out what will suit your and your dog best so that you can both be happy and comfortable. What is right for one dog may not be right for another dog, so get a little assistance on equipment and you'll both be a lot happier. Never underestimate the power of training and socializing your dog from a small pup. Being active - or proactive - in your dog's life from young makes the world of a difference to any activity outside of the home. The more positive, healthy and safe experiences your dog has with you from young, the more he will be able to take on the world with a confident happy demeanor. And don't feel defeated if your dog is not the world's friendliest or most confident dog. Be there for him by understanding that he might need more personal space. Don't allow other people or dogs to push into his critical distance. Get some assistance from a Professional so that you can learn more about him and what you can do to help him develop. Socializing and training your dog is not just an OPTIONAL activity for you and your dog. It really is a necessary practice for all dog owners! As a Companion Animal Behaviourist, I find it scary and disheartening to come across so many do owners who think it is not necessary to take their dog to training socializing (at any age!). Can you imagine a parent deciding their human child doesn't need to go to school because 'school is just a waste of time'. Do people really think they have the time and the knowledge to provide their dogs - or their children, for that matter! - with all the skills and behaviour they need to survive in urban society? Most pet lovers are very well intentioned, and they may be absolutely devoted to their dog. But this is all the more reason to invest that extra time into educating your dog and your family. Never forget that dogs are still animals. They have sharp teeth, and a single mistake or mishap can change somebody's life forever. A pup socializing with your dogs at home / or a friend's dog is not sufficient socialization. There are many positive dog training schools around with qualified people eager to spread knowledge and help!